Whether you are snowed in or just avoiding the low temperatures outside, everyone faces a shortage of vitamin D in the wintertime. Beyond that, cabin fever can have very real effects on our psyche, so no matter the destination, it is always good to leave the house. Deciding on a place to travel in December seems like a loaded query. If you would like to forget about the cold until your return home, tropical destinations are probably where your mind will take you. We will always support a little R&R on the beach; in the winter, you have the added benefit of fewer crowds, especially in the northern hemisphere. On the southern side of the planet, everyone is enjoying summertime and all the sunshine that comes with it, so all destinations there are safe for a snowy reprieve. There are also great reasons to visit colder regions during this time of year. We found places whose old-world charm is exacerbated by blankets of snow, beautiful slopes for shredding on skis or snowboards, and even mountainous resorts where you can relax with some hot cocoa and take in the picturesque landscape. Don’t let the cold gnaw at your bones indefinitely. Find your perfect escape in our recommendations below. Gold coast Floridians consider the Bahamas a second home figuratively and sometimes literally. This is because the island nation is an easy place to vacation: Everyone speaks English, and American currency is perfectly acceptable everywhere. When you aren’t worried about much else, it makes enjoying the sand and beach life all the better. The name of this central Ecuadorian city comes from the thermal baths that it is famous for. Beyond the hot springs, you will also find intoxicating greenery amid waterfalls and rapids, where many will hike and whitewater raft. Avid scuba divers or other water sport enthusiasts will love discovering the treasures of Ambergris Caye. Belize’s dry season occurs during winter months, so you won’t risk having your plans ruined by weather—unless you haven’t prepared for gorgeous sunshine and lush flora. If what you need is a dive deep into nature, immerse yourself at the Berkshires. The area will likely be covered in snow already, making it truly a winter wonderland. It is a quiet town that values nature, featuring farm-to-table restaurants and protected forests and gardens for your admiration. One of many coastal cities of South Africa, Cape Town also happens to be its national legislative capital. Experience summer at any of the local terrestrial attractions, or embark on an adventure to whale watch out in the open ocean. The picturesque region of Darjeeling in eastern India is best known for its style of tea, but it offers much more. A Wes Anderson film, The Darjeeling Limited, was set on its historic rail line, which travels through the Himalayas for some of the most spectacular views you can imagine. And don’t worry, snow in the region does not typically begin falling until January. Dubai's temperatures can reach the mid-100s in the summer, so the only reasonable time to go would be in the dead of winter. And even then, you will find it is a comfortable 70s. In the past few decades, the city has maneuvered itself to the center of the world it seems, and that means plenty of things to do for visitors including but not limited to theme parks, aquariums, parks, clubs, beaches, and more. The island of Hawai’i, also known affectionately as the Big Island for obvious reasons, is a great destination no matter which season. The weather is unbeatable and of course, there is no passport required to visit this faraway paradise. You won’t be beating the snow in your trip to Wyoming in December, but you will have plenty of opportunities to shred it. The slopes and resorts aren’t the only draw either; the Tetons are adjacent to Jackson Hole and Yellowstone National Park is just north of there as well. Escaping to America’s southernmost point is the perfect remedy for cabin fever. The Keys are little more than sunshine and beaches, and the trip will help you momentarily forget the snow up north. You can even make a road trip out of it! The Kek Lok Si temple (pictured above) is only one of many exquisite landmarks on Penang Island, off Malaysia’s west coast. It can be a good place to recharge spiritually at places of worship, explore nature at botanical gardens and national park, or just by soaking up the sun on the beaches all over. 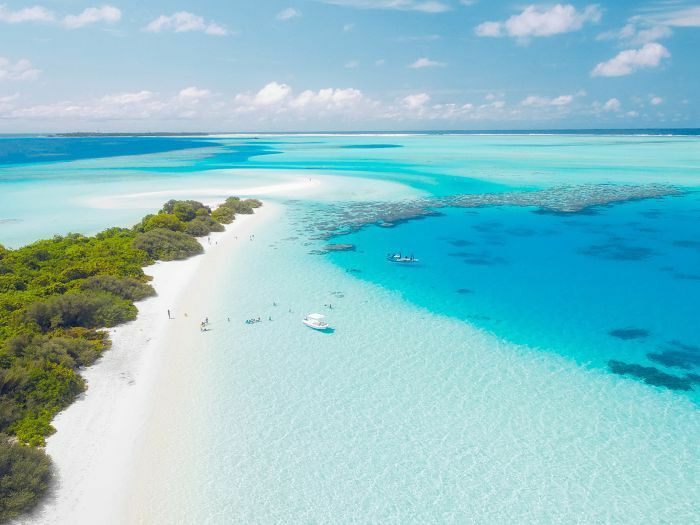 If you are looking to enjoy a tropical paradise, consider a visit to the archipelago Maldives. The Indian Ocean is warm, which warrants plenty of seaside adventures no matter which of the many member islands you choose for your vacation. This quaint Canadian town is just a short distance from Montreal and an even shorter drive to the Maine border. If you are lucky, it will snow before your visit so you can catch a glimpse of the city dressed in white and hopefully snap a few photos of the winter wonderland while you’re there. A trip to Savannah can feel like a trip back in time, given the vibrancy of the historic city. Landmarks from American history are located all over, and the beauty of the well-maintained architecture will make you yearn for the olden days that you never even knew. Often mistaken as the Australian capital, Sydney happens to be one of the most visited cities in the world. And for good reason—its many landmarks, from the Opera House to Bondi Beach, give it international renown and make it worth second and third visits later on.